LOS ANGELES — The Los Angeles City Council’s Trade, Commerce and Tourism (TCT) Committee met Jan. 13 to review and comment on a report on issues related to waterfront redevelopment in San Pedro. While a majority of the nearly one-hour conversation focused on how to make the L.A. Waterfront a vibrant destination, neither the discussion nor the report addressed how redevelopment of significant portions of Los Angeles Harbor would impact local boaters. A report from the city’s Chief Legislative Analyst (CLA) suggested the city council approve its seven recommendations to foster redevelopment at the L.A. Waterfront. While those recommendations will still be fleshed out by city staff and the TCT committee during the next few weeks, boating interests were noticeably absent from the CLA report. Still, TCT committee members pushed for redevelopment of the L.A. Waterfront to become a priority project. The CLA report is expected to serve as a tool to guide the decision-making process as port, city and state officials plan the redevelopment. A key theme emerging from the recent discussion on the feasibility study is the role of residential housing. Committee members agreed pursuing dense housing development is necessary to realize transformative development at the L.A. Waterfront. “This report is going to be used as an instrument to seek that transformative change,” Buscaino said, adding there should be enough dining, entertainment and retail options to make San Pedro a destination seven days a week as opposed to a place where visitors trek on a Saturday afternoon. However, while officials have discussed extensively how to make the L.A. Waterfront a viable destination for residents, local visitors and tourists, the conversation did not shed light on how any proposed redevelopment in San Pedro and Wilmington would impact boaters. 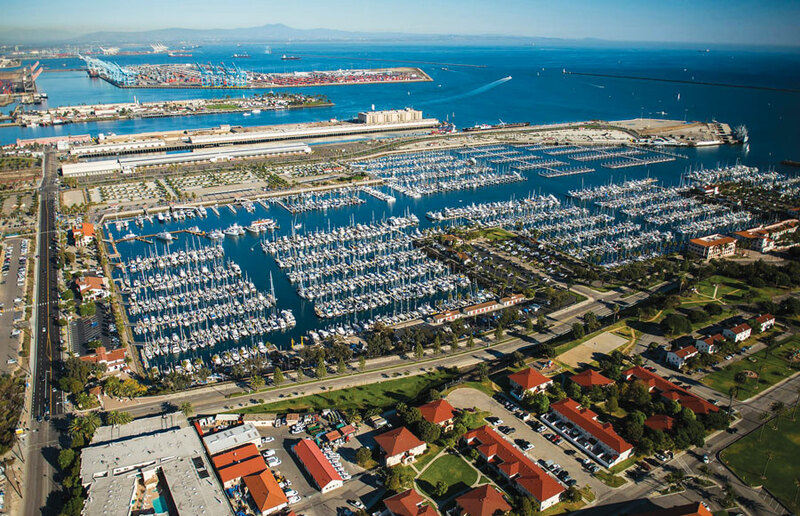 According to information provided by the Port of Los Angeles, there are 16 anchorages, landings, marinas or yacht clubs in San Pedro, Terminal Island and Wilmington, including Al Larson’s Marina, Cabrillo Way Marina and Lighthouse Yacht Landing. For example, would redevelopment result in the loss of slips? John Wickham, a legislative analyst with the city of Los Angeles, said one of the biggest barriers to pursuing new development in Los Angeles Harbor is a City Charter provision placing restrictions on leases. Specifically, Wickham said the City Charter places as much as a 50-year limitation on contracts, meaning the city cannot enter into a lease with anyone at L.A. Harbor for a term of more than 50 years. The limitation also prevents extensions. Wickham said a similar restriction exists on the state level. Buscaino directed city staff to look into how to overcome the lease restriction. A significant amount of money could be invested in the L.A. Waterfront if some sort of solution is discovered. In December 2014, officials announced $50 million would be committed during the next five years to upgrade critical infrastructure as part of the Ports O’ Call redevelopment. “We are committed to developing Ports O’ Call in the most expedient manner possible. We have committed $50 million. We have re-engaged negotiations with the L.A. Waterfront Alliance. We are on track with a lot of the recommendations,” Mike Galvin, director of special projects at the Port of Los Angeles, said. At least one member of the public told committee members any redevelopment in San Pedro should benefit everyone, not just commercial interests. John Papadakis, a San Pedro native and local business leader, said the most glaring issue surrounding San Pedro is its poverty. “Our area became an … industrial dumping ground for the city, myopically creating astounding industrial success, which we don’t stand against. We think it’s great. Your industrial mansion is great, but at the same time, [it creates] a commercial wasteland and quality of life seaside nightmare for its own people,” Papadakis told the committee. Papadakis added any redevelopment must provide primary public access to the waterfront and provide economic opportunity for everyone in the region. Council member Mike Bonin, whose district includes a coastal community balancing economic blight with desires to make the area a visitor destination, said he can relate to Papadakis’ concerns. Bonin added the TCT committee, Mayor Eric Garcetti and city staff will be pushing to redevelop San Pedro’s waterfront as fast as possible. Tom LaBonge, the TCT committee chair, pointed out Pier 39 – which, like the L.A. Waterfront, sits on tidelands property – was quickly redeveloped. The CLA report’s recommendations called for an evaluation and recommendation of management options for the San Pedro Waterfront Master Plan, the development of a transportation and circulation plan, the hiring of a consultant to conduct a market analysis of commercial opportunities and residential constraints at the waterfront, and a plan outlining phases of development, among others. The TCT committee will discuss Ports O’ Call redevelopment at least once more before forwarding the topic to the full city council.